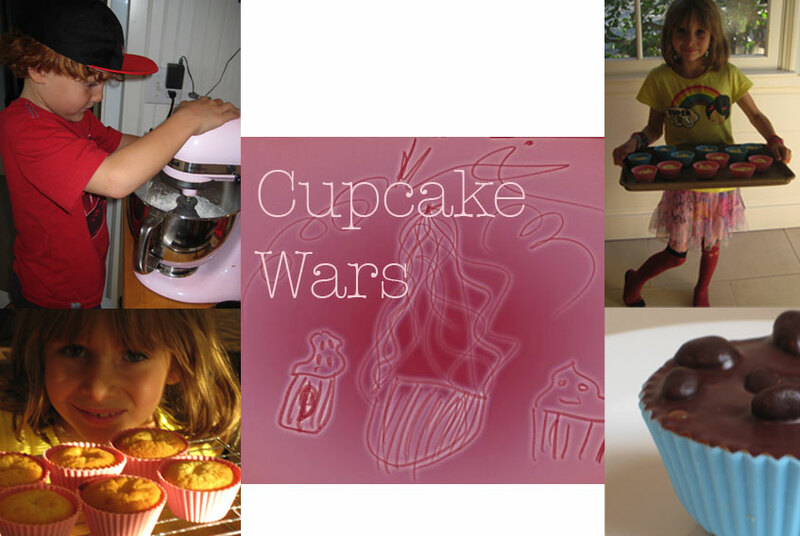 Cupcake Wars from Lucy Lean on Vimeo. Adapted from one of my go to favorites – How to be a Domestic Goddess, Nigella Lawson. I always smile when I open this book and on the inside front page long before kids and domesticity really set in I wrote in pink ink: “This book belongs to Domestic Goddess Lucy Lean”!!! Sigh! Cream together butter and sugar in the mixer until pale yellow. Add eggs and 2 tablespoons of the flour, vanilla extract, and 1 tablespoon of the milk. Gently fold in the remaining flour and if needed the rest of the milk – to make a soft batter that ‘drops’. Divide the mixture equally between 12 cupcake cases and bake in the oven for 15 minutes or until the cakes are golden brown. Cool on a wire rack completely whilst you make the frosting. Mix all the ingredients together in the mixer and then smoother the cakes! Servings enough for 6 cupcakes and lots of licking! In a small saucepan warm the ingredients to melt the chocolate. Bring to a boil, remove from the heat and whisk until smooth and thickened. Cool before icing the cupcakes. If it gets too cold and solid re heat slightly.